On NOV 6th and 7th at San Francisco State University we hosted an exciting line-up of filmmakers, researchers, VR, and discussion about all things nonfiction. We welcomed keynote speakers Jules Rosskam (University of Maryland, Baltimore County) and Sharon Daniel (University of California, Santa Cruz). Jules Rosskam presented the day one keynote, Borders, Boundaries, and Bodies, or How I Got To Be Here: Jules Rosskam, screened his newest film, Paternal Rites and gave workshops during the conference, while interactive and participatory media artist Sharon Daniel presented the day two keynote, The Evolution of "Public Secrets." We were excited to also host artist, video maker and cinematographer Arthur Jafa in conversation with musician, producer and artist Greg Tate. To close out the conference we screened the documentary, Survivors. Members from the Survivors team were present for a Q&A following the film. "Through the eyes of Sierra Leonean filmmakers, Survivors presents a heart-connected portrait of their country during the Ebola outbreak, exposing the complexity of the epidemic and the socio-political turmoil that lies in its wake." 9:30 am - 10:45 am, Who Can Occupy this Space? 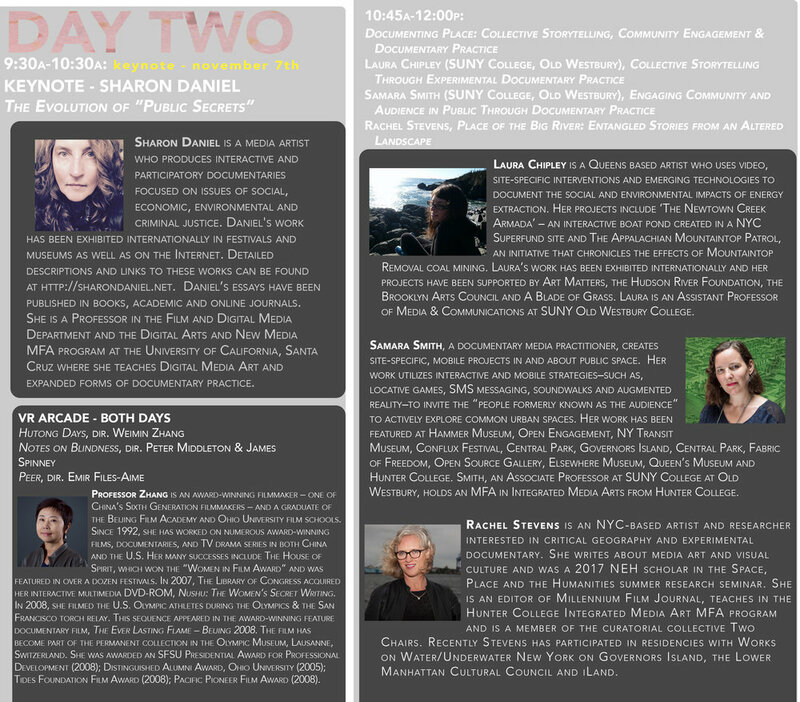 The inaugural Pluralities conference was held at San Francisco State University in November 2017. The gathering brought together scholars from across the globe as well as regionally to present their work and converse about the expanding state of documentary and nonfiction media. Presentations topics ranged from the power of animation in resistance, digital publishing and distribution of niche films, agency and advocacy in film surrounding personal identity, activism, disability, ethnography and the presentation of a "live documentary" retracing German influences in Canada leading up to WWII as well as a VR experience of the amazon rain forest. 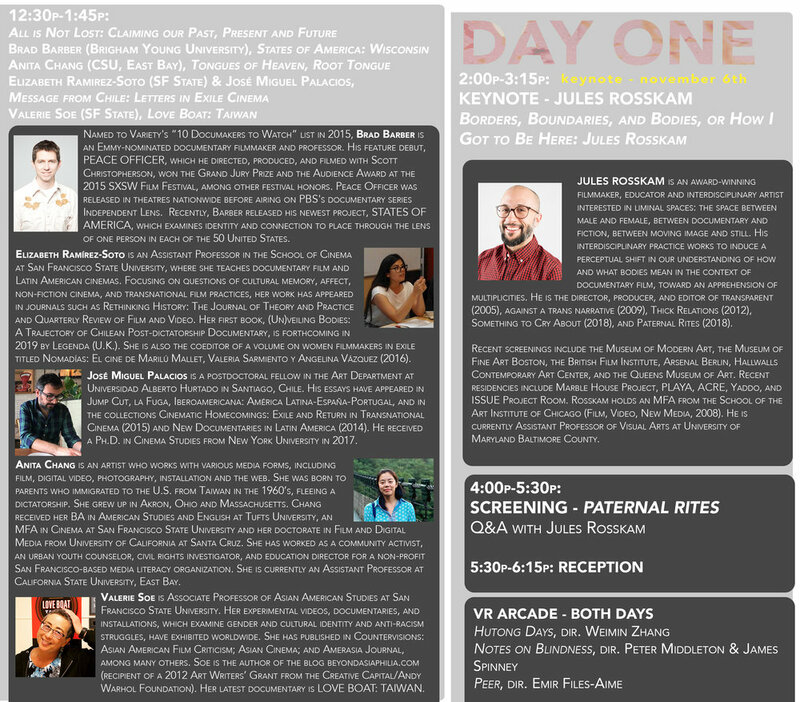 Over 500 people attended sessions at the two day event bringing together scholars from film, history, anthropology, and ethnic studies along with students, local filmmakers, and regional thinkers in the field outside of academia.